Norman Bruce “Ike” Buchanan was born in St. Stephen, New Brunswick on 16 September 1915. 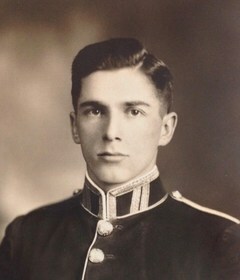 He attended the Royal Military College of Canada from 1934-1939. He graduated as a Lieutenant in the Canadian Artillery. After graduation, Ike served at the Partridge Island Battery in Saint John, NB from 1939 to 1940. Ike served in World War II from 1940 to 1945. In 1940, Ike traveled to Great Britain and then seconded to the British 1st Army. In 1942 and 1943, Ike served in North Africa with the British Army as a Forward Observation Officer (FOO). In 1943, Ike served with 1st Field Regiment, RCHA, 1st Canadian Division in Sicily and Italy. He then moved to the 14th Field Regiment, RCA, 3rd Canadian Division. He landed on Normandy and remained in action until the liberation of Europe. He received his first Military Cross for actions in North Africa (Tunisia) on 22 February 1943. While serving as a Troop Commander with the 1st Canadian Division, Ike received his first bar to his MC for action in Italy on 7 October 1943. He received his second bar to his MC for actions during the invasion of Normandy on 7 June 1944. Ike received his MC with two bars for three separate acts of exemplary gallantry. Only 23 Commonwealth soldiers have the MC with 2 bars. He is the only graduate of the RMC and the only Canadian Gunner to hold this honorable distinction. King George VI presented Ike with the Military Cross with two bars. Ike was a family man that married Janetta (Netta) C. (Wilson) in 1944. After the war, he returned to civilian life in New Brunswick. In 1952, he became an MLA for Charlotte County. From 1952 to 1960, he was Minister of Forests in NB. During this time he championed economic development and industrial growth. He applied his engineering knowledge to public works projects. He helped modernize the airports of Bathurst, Fredericton, Moncton and St. John. He promoted the development of a large zinc mine in Bathurst and forestry in New Brunswick. As well as raising a family, in 1965 Ike was Mayor of the Town of St. Stephen and served his community until 1966. In 1965, he established a business partnership, creating a sporting goods company called WinnWell. He supported his family business, Buchanan Bros. Ltd., a furniture store started by his father. Ike worked in the family furniture store until 1983. Ike served in the Militia and became the Commanding Officer of the Carleton and York Regiment with the rank of Lieutenant-Colonel. He motivated and inspired his troops, and led them during public ceremonies. Ike excelled in amateur sport. In 1936, Ike was a pitcher on the championship winning St. Stephen – St. Croix team that was later inducted to the New Brunswick Sports Hall of Fame in 1971. Of note, Ike pitched against Babe Ruth during an exhibition game in Halifax. After the war, Ike curled on his father’s team that won the New Brunswick title, and Ike curled in the Brier. Ike and his business partner, Norm MacLeod, invented the fiberglass hockey stick used worldwide. Ike has inspired many during his lifetime. He was a war hero, an elected official, a successful businessman and an outstanding role model. Throughout his life, he serviced Canada with dignity and honour. He is an excellent example of bravery, determination and selfless service. Ike passed away in 2008. In September 2018, the Royal Military College of Canada placed Ike on their Wall of Honour.